1BR/1Bath - $74/Nite! Spend Your Holidays & Winter With Us! Open continuously since 1998, IslaMar Villas is one of the few remaining owner/operated vacation rental facilities on the island. Sure there are alot of hotels to choose from but how many of those hotel owners or managers will know your name or remember you next time you visit? Owner/operator Sherri Davis would like to thank all of her clients for giving her the opportunity to celebrate 20 years of operation! Newly remodeled in 2014, IslaMar Villas now has more garden space, refurbished pool/spa, sidewalk and porch resurfacing in the commons area, all new flooring, granite kitchen counters and a completely redesigned bathroom with all new fixtures. We're always updating and improving the villas and for 2018 we have flat screen TV's and redecoration in all units! Offering quality and value, an IslaMar Vacation Villa provides the perfect get-away for you, your family and friends to enjoy tropical island living at its best! Sherri and her staff are always nearby to personally assist guests with their vacation needs. Your IslaMar Villa will be situated around a common garden, pool, waterfall & jacuzzi area. The entire complex is surrounded by a ten foot privacy/security wall. IslaMar is located in a regular neighborhood (out of the tourist zone), just a ten minute walk from Downtown or beach areas. Just around the corner is a neighborhood grocery as well as a family play park. Nestled in the heart of Mid-Town Cozumel, IslaMar is popular among those who travel extensively or visit the island frequently and are looking for a more authentic cultural island experience rather than the glitz (and expense) of the tourist zone. Let IslaMar Villas become your island get-away... it's NOT just another place to stay but a perfect way to transition from 'hotel staying' to 'island living'! Small businesses in Cozumel value their customers and IslaMar is no exception as one of our staff will be waiting just for you on the day of your arrival to ensure you get settled in for a wonderful vacation stay. Contact Sherri now and start planning your next Cozumel vacation to come and enjoy our fresh new look! In this particular listing I offer on VRBO, I can still accept payment via my own means. Consequently, the following (below) is our booking and cancellation policy which I have used for 20 years. Rental Reservations are confirmed by receipt of a 50% deposit of total rental amount due plus any Security Deposit required. Deposits must be received within 5-7 days of requesting a booking or the rental space is released. The remaining 50% rental balance owed is due 60 days PRIOR TO arrival date. Cancellations are effective on the date written notice is received by fax or e-mail in our office. The following assessments will apply on cancellations: Cancellations prior to 90 days from arrival date will result in a refund of Rental and Security deposits made LESS a $175 processing fee. Cancellations prior to 60 days from arrival date will result in forfeiture of the Security as well as the Rental Deposit which is 50% of total rental amount. Cancellations made less than 60 days prior to Arrival result in forfeiture of Security Deposit plus 100% of total rental amount. On my first visit to Cozumel years ago, I simply could not believe that a person could leave DFW, fly for a bit over 2 hours and end up in a place as remote and primative as Cozumel was back then. There is something about the island that simply draws visitors into its charm. As a scuba diver, I found heaven on earth in the beauty of the reefs that surround Cozumel and I simply never wanted to leave! Having my 6 IslaMar Vacation Villas gives me the chance to share the Cozumel I know with others who enjoy island living type vacations! 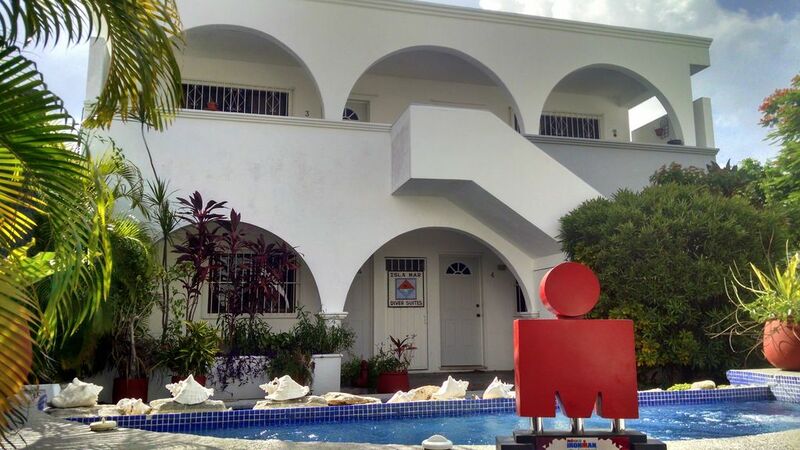 One of the main reasons folks come back to my IslaMar Villas year after year is because it is one of the few remaining owner operated vacation rental facilities in Cozumel. Many Cozumel vacation rentals are handled nowadays by property management companies (no owner on site). My staff and I are on site daily and try to ensure that guests have the best possible vacation experience while here on the island. We assist guests with everything from coordinating car rentals and excursions to sharing information about less expensive 'locals' places to hang out. Our goal at IslaMar is to make a 'regular' out of you! Another thing that sets IslaMar apart from many other properties in Cozumel, is that we are actually operating a legitimate business within the community complete with all applicable business licenses, safety inspections and legitimate legal structure to provide property rentals in Cozumel. As members of the Cozumel island community, we at IslaMar feel an obligation to comply with local regulations and help support road and infrastructure development rather than ignore or evade these regulations and fees as so many vacation rentals do on the island. As they say 'It takes a village.' and we must all CONTRIBUTE (by paying licenses/fees,etc.) to improve our community. Located in Commons Area for local calls. Properly sized AC units to ensure your comfort. Sheets and towels are provided and changed by the maid staff. Extra pillows and blankets are always available. On site equipment used by the maids but guest laundry services are available for a nominal charge which supplements the maid staff's earnings. Providing this service ensures guests can relax and enjoy their vacation time. Parking is streetside in front of the IslaMar Villas buildings which is standard throughout the island. Bath and hand towels are provided as well as facial size, too. Living room features sofa and loveseat with 42" flat screen TV. The top freezer of the refrigerator has lots of ice trays! For safety purposes, villa is all electric (no gas) and features a built in 2 burner electric stove tops. A toaster oven is provided for baking potatoes or small casseroles. The kitchen has an array of stainless steel pots and pans and cooking utensils as well as plates, glasses and silverware. Part of the toaster oven provided. Some plastic ware and kitchen items are included such as can/bottle openers, storage containers, etc. For sanitation reasons, no food items are provided. Cook Services are provided by many local restaurants and private chefs. Dining area seats 4 easily since each villa is quite spacious. Color 38" - 42" Flatscreens in all villas. The flat screen, color TVs in living areas have cable service including several channels with English language programming. Guests contribute to our continually changing IslaMar library. Lots of board games and cards available in commons area. A wide selection of DVD movies available FREE. Second floor villas have a large front balcony that overlooks the pool and garden area. There is a large paved area around the pool and an area of grass plus flowers and a large tropical shade tree. IslaMar also has downstairs units listed on this website where wheelchairs can be accommodated. There are 2 separate sections to the swimming pool. There is a raised 'spa' area with seating for 4-6 that fills & cascades over a rock waterfall wall into the main pool. The depth of the main pool goes from approximately 2 feet to 4.5 feet deep. There is a jetted spa area to the side of the pool but is NOT heated. There is a raised 'spa' area with seating for 4-6 that fills and cascades over a rock waterfall wall into the main pool. Strong water jets provide a relaxing massage. This area is NOT HEATED due to tropical environment. Twice weekly maid service for towels, linens, bathorooms and floors is included. However for sanitation reasons, guests are expected to maintain their spaces free of open food stuff and dirty dishes. Porch hammocks and a dive equipment & snorkel gear rinse tank are available outside for guest usage. NOthing to complain about, everything was fine all along our stay. It was delightful having the chance to get to know you and have you with us for 3 weeks in one of our 6 IslaMar Villas! Time flies when you're having fun and it seemed to whiz by as you were here with us ~ we especially enjoyed the days you came out to our beach and spent the day snorkeling and hanging around the pool! Remember to book early for next time as all of our "regulars" typically slot in for the year ahead as they are leaving each season! Thank you again for selecting IslaMar and please know that as a small property owners, we appreciate your business and your referrals!! Can't wait to see you again soon! I stayed on Cozumel for 3 weeks (this being my 5th trip) and I can say this spot is my favorite by far. It's an amazing cozy little villa and I enjoyed coming home at night as much as going out! Everyone is super friendly, things were clean to my mom's standards (which is almost impossible) and I always felt safe! I will definitely be going back! We visited Cozumel in March 2016 and stayed at the Islamar vacation rental location for a week. This location is a great place to stay. Cozumel is dominated by the Cruise Ship industry and Islamar is far enough removed from the crowded areas to give guests an authentic experience of the community apart from the tourist crush. At the same time, if you want to partake of the touristy stuff, it's a 20 to 30 minute walk to the oceanfront and the downtown core. And if you don't feel like walking, there's always taxis coming and going and it only costs a couple dollars to get there. The apartments are spacious and clean, and the grounds provide a nice quiet spot to enjoy the sun and pool. The neighbourhood has everything you could possibly need, grocery stores, a bakery, restaurants and bars that are popular with the people who live here. A great perk for guests who stay at Islamar is access to the PalMar beach club. Beaches aren't a big draw in Cozumel, but the snorkelling and diving are great, even snorkelling from shore. So while there are a number of access locations to the water, there are very few places that offer a sandy spot to sit with beach chairs and umbrellas. And the few that do exist are pretty crowded. That's where the PalMar beach club really shines. It's located about 6 or 7 km from the apartment, a nice and easy bike ride away and there's all the amenities you could want. Beverages and snacks across the road from the sandy beach front where tables, chairs and loungers are available, and then you can have a leisurely swim and snorkel right there. We've been snorkelling in several locations in the Caribbean, but nothing even comes close to this. I doubt you'd have a better experience on a boat excursion out to deeper waters. Sherri is a wonderful hostess, and her staff are extremely friendly and helpful. They were available to answer questions and help, yet we felt completely free and comfortable and never felt crowded or surveilled. They even helped arrange bike and car rentals for us. There were several services provided that exceeded anything we experienced at other rentals, namely cleaning every second day, our sheets were changed 3 times over the course of the week and there was always an abundance of towels available. A small suggestion that might be a great addition to the comforts would be to have a small supply of kitchen linens (a couple dish clothes and towels), some dishwashing liquid and a bit of plastic wrap. WE had the utmost pleasure of meeting Sherri last summer. A day to to Cozumel only we could not stop thinking of the island. We came back the following Jan and everything we imagined and hope for was true. Living with the locals, shopping, cooking exploring. It was all so wonderful. I want to come back and back. Sherri, her staff, everyone were amazing but still allowed you to have privacy. Learned a lot on this vacation and I can say were planning our holiday for July and were coming back, The rooms stylish, functional, clean. Just what we wanted, Again thank you for your hospitality and your friendship. We will see you in July!!!! We so enjoyed meeting you and having you as our guests here at IslaMar! Thank you so much for the kind review! We love making new friends and hope to have you become another of our many fans! We look forward to seeing you again soon! My son and I stayed for 1 week here and really enjoyed it. I loved being in mid-town away from the tourist areas. I used my spanish skills a lot, but I expect you could get by without if need be. Nidia and Andrea took great care of us. It is fairly modest lodging, but by American standards. The pool is quite nice, and the bed was really very comfortable. You don't always see that in Mexico! Taxis were easy to get either by phone or nearest major road. Although we went to Mega a lot, we could have grocery shopped nearby. I had several fancy maps but mostly used the one Nidia gave me with various places marked on it. Taxis were cheap to el centro. It was a more expensive cab ride to and from the beaches, but a little planning helps keep costs down. Or we could have rented a car. Staying here was HALF the cost of staying at a condo on the beach! And we can go to a club or hotel for the day to get our beach fix. This will let us take longer vacations! We are already planning our return. Very clean, safe, quiet villas located in the Mexican neighborhoods of SanMiguell. A true cultural experience! Fantastic food prepared by the locals. We caught fish and the restaurant down the street cooked them for us! The Best! Need a rental car or taxi though to go to the beaches:(. Great weather ... 81* the 3 weeks we were there! Many IRONMAN and triathlon competitors stay with us each year since we are centrally located to a very nice training pool and track and are a bit away from the crowded route areas. In general, Cozumel is an amazing tropical island paradise where travellers can just sit back, relax and enjoy its natural beauty! Don't miss doing an island tour, visiting Cozumel's Mayan ruins or swimming with the dolphins! Rates are subject to change until reservation is confirmed. ***Email us or find us online for more rental options! Rentals of LESS THAN 1 Week accepted on space available basis. ***SPECIAL MONTHLY RATES AVAILABLE FOR 1- 4 MONTHS! !